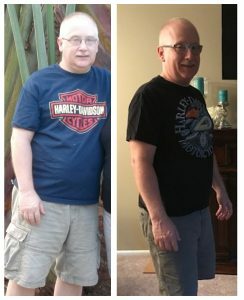 He has lost 34 lbs and 3 inches. Trained with Amanda every two weeks for about four months and worked out about 3 to 4 times a week using both cardio and weight lifting. I had been planning to take a 5 day backpacking trip (a 45 mile hike with a 50 lb backpack) with some friends of mine at the end of the summer. At our first session, my trainer, Amanda, asked what my goal was and withithout thinking, I said I wanted to loose about 36 pounds within 5 months for this trip. As I was walking away, I thought what I had gotten myself into! Amanda provided advice and encouragement on my cardio routine and nutrition. She also gave me new exercises to incorporate into my routine to help with core and strength training. I adjusting my nutrition to be healthier which definitely helped. I changed up my nutrition several times because, to be honest, I got bored with it. I did however generally limit my carbohydrate intake and increased the amount of protein I consumed. I found that the exercises I could barely do when I started, are now easy and I have to make them harder. I felt better than I had in a while and had a lot more energy. When the day of my trip came around, while I was just short of my goal, I was thrilled how far I had come and how prepared I was for my trip. What I did not expect was the amount of positive responses I received from people. There have been so many people that have gone out of their way to remark that they had noticed the change and how healthy I looked. The only downside so far is that many of my clothes no longer fit, I guess it is time to go shopping!